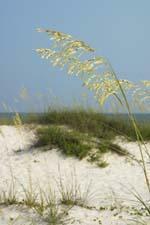 Enjoy the white sands of Orange Beach. Orange Beach vacations can include a wide variety of activities like golf, sailing, fishing and shopping. The best choices, and best deals, are usually made by those who have done a little research. Orange Beach may be the perfect vacation spot for you if you are looking for a wide variety of affordable lodging, great restaurants and lots of golf and fishing opportunities. Orange Beach is part of the Alabama Gulf Coast. It is on the eastern end of a 32-mile island directly off the northern coast of the Gulf of Mexico. It is located at the southernmost tip of Alabama - about halfway between Mobile, Alabama and Pensacola, Florida. The temperatures in Orange Beach are usually warm all year round. The average daily temperatures range from the 80s during the summer to the high 50s during the winter. Hot summer days are cooled by the Gulf breezes. The warm spring and fall days are balanced by cool evenings. Two airports serve the Orange Beach area, the Mobile airport which is 50 miles northwest and the Pensacola airport which is 35 miles east of Orange Beach. Both airports are serviced by major airlines with connecting flights into a variety of cities including Dallas, Atlanta and Miami. Flight schedules are available from the airport websites. Future schedules and prices are easily available online by searching through an Internet travel search engine such as Booking Buddy. Rental houses - Many of the beachfront houses have been recently rebuilt and are excellent "home bases" for families and vacation groups. Condos - Orange Beach has many new condos including many right on the beach. Hotels and motels - If you are looking for accommodations with housekeeping and food services, there are many hotels and motels available, of which many are pet-friendly and handicap accessible. The fastest way to see the widest number of lodging alternative is to check out the centralized online listing of what's available provided by the local business and convention organization. Fishing - Fishing is a very popular sport in this area of Alabama. The area has the largest artificial reef program in the United States with about 1,200 square miles of fish habitat. Orange Beach is the home port for one of the largest fishing fleets on the northern Gulf Coast with over 100 charter boats.